The EUR/USD pair has completed a descending wave. At the moment the market is developing a rising structure. 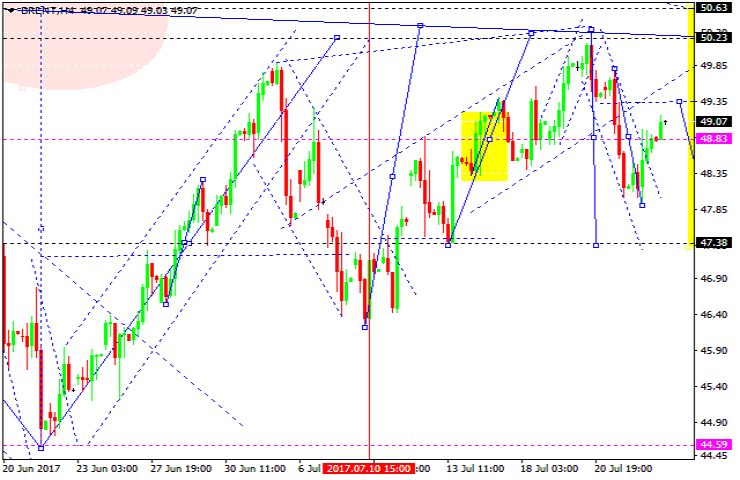 This structure can be deemed as a correction move. It is expected that a Flag will be formed of five waves. For today, we'd consider a move towards the 1.1646 level. Then the pair can move highet towards 1.1666. Yet another scenario is a third wave to break through the 1.1620 level. The local target stands at 1.1584. It is not improbable that the price can spike towards 1.1689. After that it can go lower to reach and break through 1.1620. 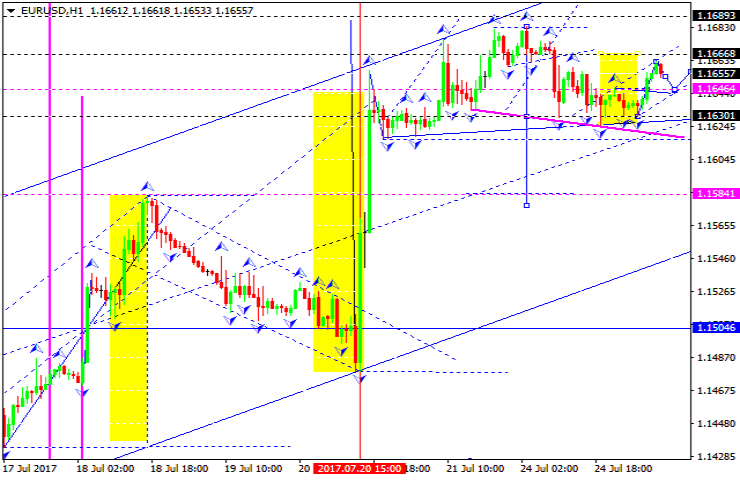 The GBP/USD pair has completed an ascending wave in form of a Flag for the descending Flagpole. For today we'd consider a possible breakout of the rising channel. The first target stands on 1.2985. Therefore, we are considering a consolidation range to be formed. If it is broken from top downwards, a descending wave towards 1.2948 is possible. 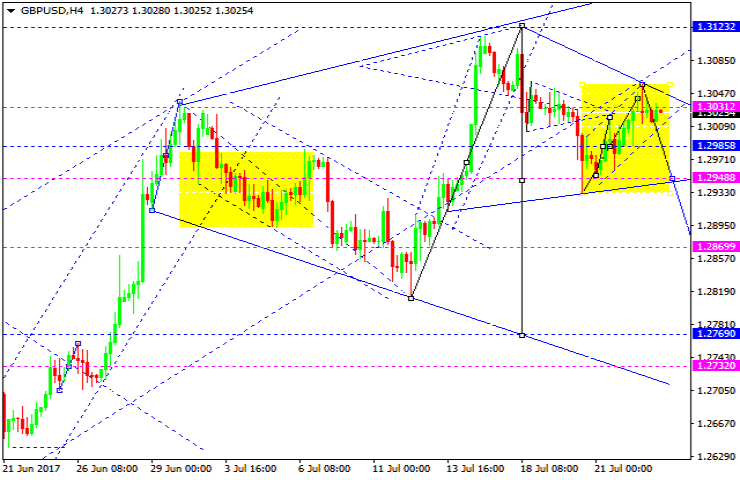 If the price breaks out of the range from bottom upwards, it can go higher towards 1.3123. 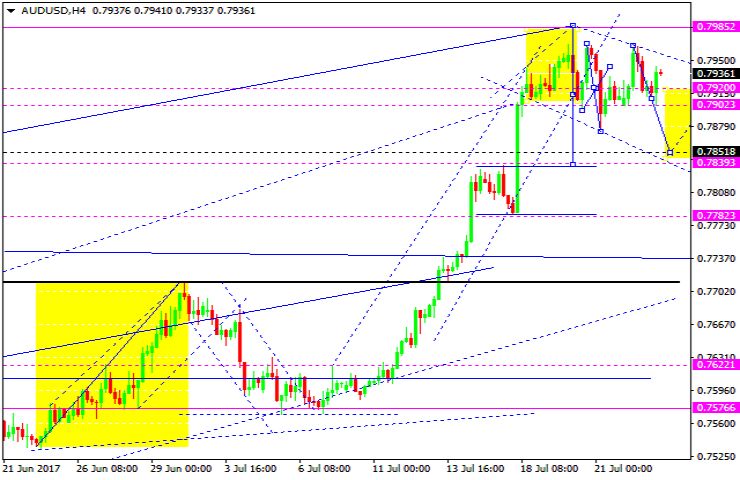 The USD/CHF pair is trading within a rising structure towards 0.9480. 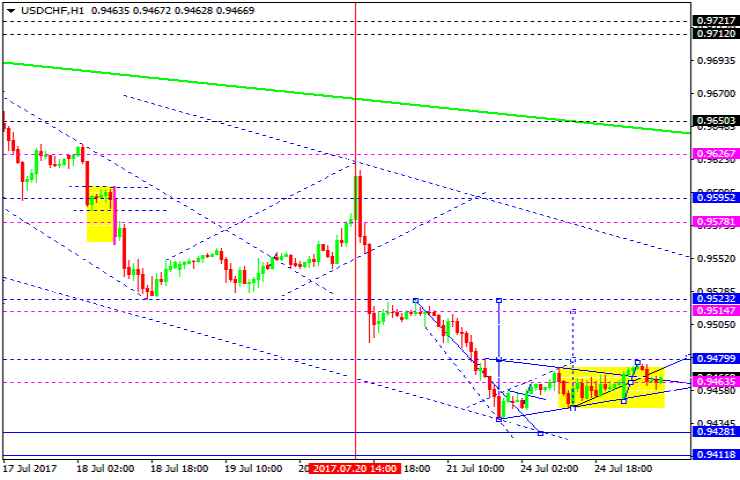 As the next move, we are expecting a downwards leg towards 0.9463. If the range is broken from bottom upwards, an ascending move towards 0.9514 is possible. In case the price breaks out of the range from top downwards, the market can go lower to reach 0.9428. After that it can climb towards 0.9520. The USD/JPY pair keeps developing it descending wave. A new consolidation range has appeared and formed its borders. 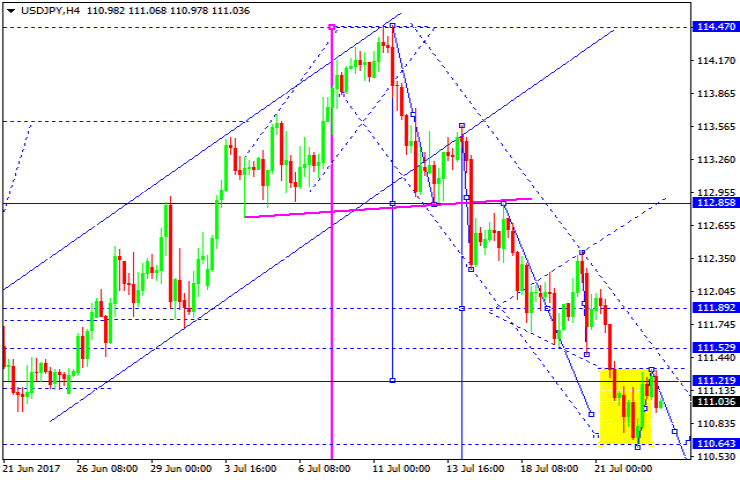 If the lower edge of it is broken, the price can move towards 110.19. If the upper border of the range is broken, a correction move towards 111.89 can occur. The AUD/USD pair keeps trading within the consolidation range on top of the ascending wave. A downward move to 0.7852 is expectable. Then the pair can climb higher towards 0.7920. After that it can decline to reach 0.7780. The USD/RUB pair has broken through the consolidation range from bottom upwards and completed the calculated move towards 60.00. 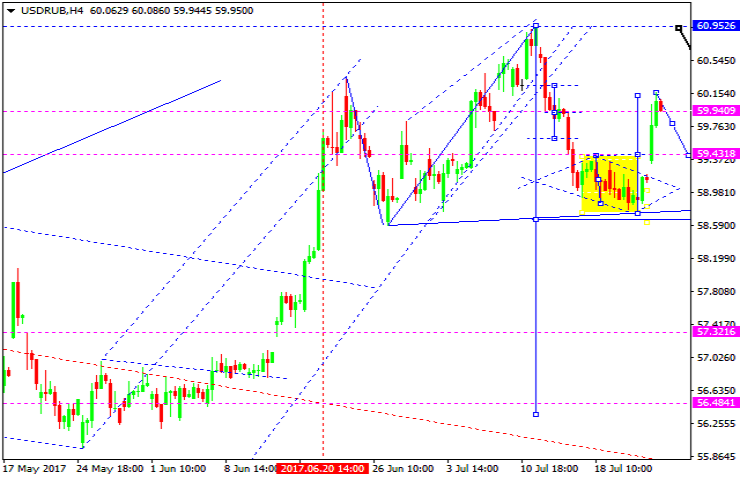 A downward move towards 59.43 is possible. The basic scenario for the pair is the downtrend to go further to reach the 57.70 level. 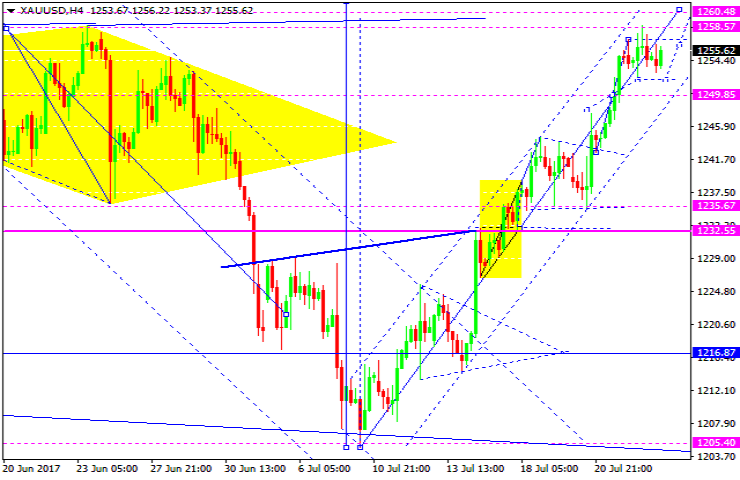 Gold is trading within a tight consolidation range on top of the ascending wave. For today we'd consider a possible break out of this range from bottom upwards to reach 1260.50. If the range is broken from top downwards, a correction move towards 1232.55 is broken. Oil is trading moderately higher trying hard to climb. For today we'd consider the level 49.40 to be reached and broken. Another scenario is a downward move towards 47.40. This will be the end of the correction move in our opinion. After that a rise towards 50.65 is possible.